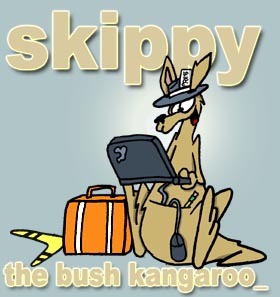 s skippy the bush kangaroo: look! up in the sky! it's a bird! it's a plame! look! up in the sky! it's a bird! it's a plame! emptywheel, she started covering this story because she didn’t want this story to have happen to it what happened to the iran contra story…it faded away and poindexter came back and started a data base on americans. she wants these guys to be held accountable. blogging is great because it adds the dimension of "character" to the story. the words "steno sue" say so much about her. the other thing blogtopia (yes! i coined that phrase, but emptywheel didn't use it, damn her) can do is to narratize the story, admitting full well that you are making a test case. providing you make the caveat that you are speculating, it's a useful tool. case in point, emptywheel speculates that richard armitage is the mr. x in the story, the source of the into to r. novak. emptywheel wrote speculative posts which described a narrative in which armitage was mr. x, and those posts have held up well. another good thing blogtopia (you know the drill) is good for is to see how the msm spins. ok sorry kids i was busy blogwhoring my live blogging on other blogs i missed the rest of emptywheel, but she says keep working and let's hold these guys accountable.